Today's postcard is one I am very excited to share with you. I have been a fan of Juliane Strittmatter's work for several years, so I was delighted when she said she could make the time to send this postcard from her home in Sweden. 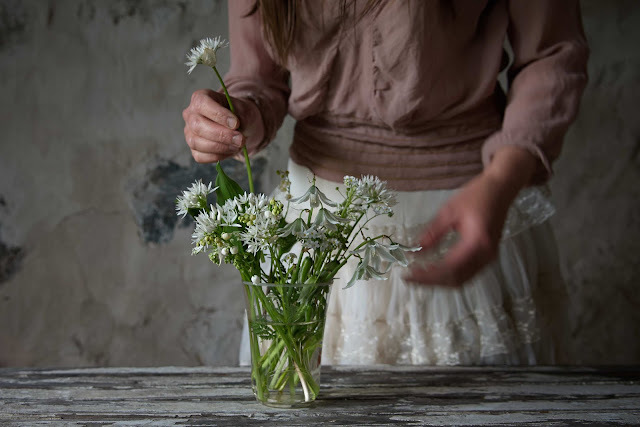 Everything Juliane shares on her blog, on Instagram and through her bespoke creations, speaks of a meticulous attention to detail, coupled with a truly beautiful aesthetic. Her postcard is no different. I hope these lines find you well. This photo was taken at Björkåsa, our small farm close to Sösdala in Skåne, south of Sweden. It is my daily view, across the meadows to Store Mosse, a large bog, with Spragebjär, an extinct volcano on the horizon, towards Linderödsåsen, a ridge of hills that stretches down to the Baltic Sea. Down in the meadows, hundreds of cranes are gathering at this time of year to fly southwards. Four years ago, I took the opposite direction and moved up north, for love. I left my hometown Berlin and the cosiness of Prenzlauer Berg, my neighbourhood, to live here in Skåne. The first three years we rented a house until last spring when we finally found Björkåsa, a house on a hill, surrounded by old oak trees and birches, with an overgrown garden and an old barn down the meadow - and with the beautiful view you see in the photo above. 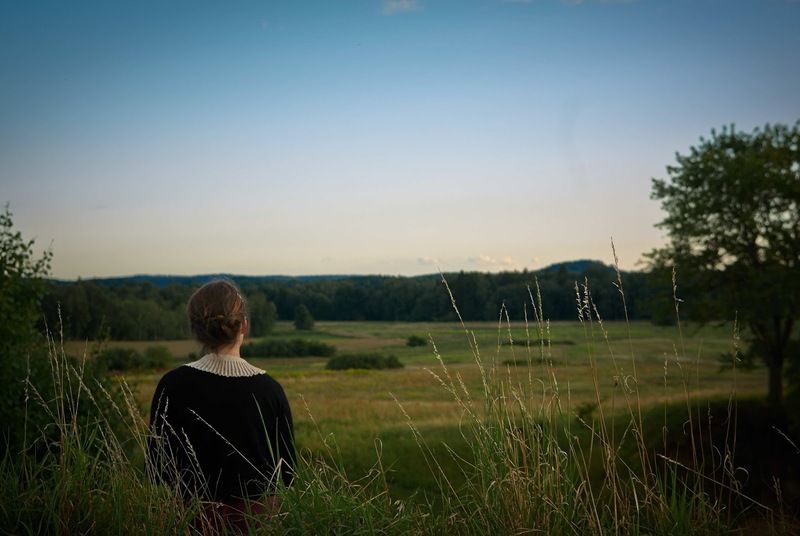 It was the view and the quiet we fell for when we decided to buy the farm in May 2015 and we haven't regretted our choice, not even in the dead of winter when we got cut off from the road, snowbound for days. I am a puppeteer by profession and studied Performing Arts/ Puppetry at the Ernst Busch Academy of Dramatic Art (Hochschule für Schauspielkunst Ernst Bach) in Berlin. I worked for theatre and TV but found my professional options as a puppeteer to have become rather limited since my move to Sweden. 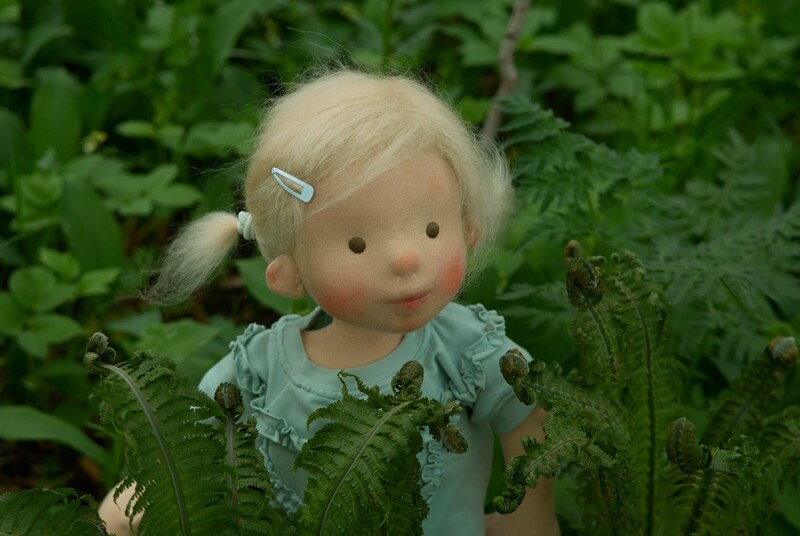 Already in 2008, I had started making dolls for children and sold my products online, but the chances of working with a professional puppet theatre in the countryside were rather slight which is why I am now almost entirely focussing on doll-making. In 2013, I decided to join Instagram. As an excuse for using yet another social media channel (helping me to be connected from the seclusion of our life in the countryside), I came up with the idea to challenge myself to pick a daily bouquet from May to October, take a photo and share it on Instagram. It was a fantastic way for me to get to know our surroundings and what was growing here, on my daily walks. 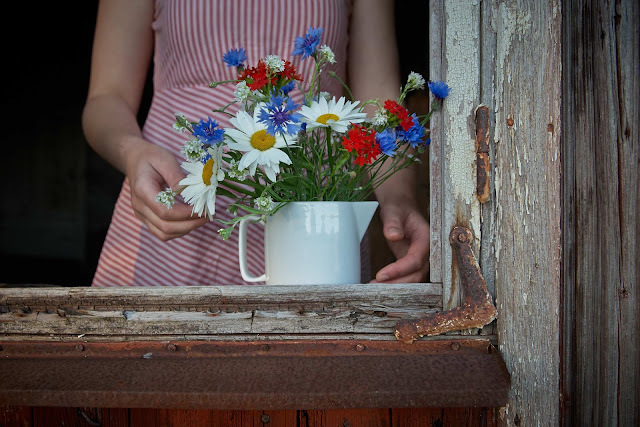 And to put posies on every windowsill in our house, while connecting and staying in touch with friends. The #onebouquetperday series is a self-portrait project with focus on the flowers I pick and the stories these bouquets tell throughout the seasons. In the very beginning, my photos were taken with an iPhone, but nowadays I'm taking them with a Nikon DSLR camera, a tripod and a remote control. Since May 2013, the project has gained more and more followers. Others have started to post their daily pickings under the same hashtag and I've been interviewed about the idea in magazines, blogs and have contributed to books. Soon I will have my first exhibition with a selection of my #onebouquetperday photos. In the meantime, my daily walks have turned into a routine that has become very natural to me. I need these moments every day to clean my mental windshield, to nurture my creativity and to boost my mood. Picking flowers on a daily basis helps me to stay focussed. It reminds me of the essentials and brings me back to the basics, even if a day has been busy and stressful. I have my 'power trails', certain paths and routes I take several times a week, spots where I can recalibrate my ideas and my senses. To me it feels like pressing the 'reset' button, even if it is only during a very brief walk through our own overgrown garden to pick a few flowers. I need these moments that allow my thoughts to wander, to rest and recover. We are currently renovating and rebuilding our house and turning a shed into a workspace for me. If you would have asked me two or three years ago about my dream studio (and if I wouldn't have had to think about storage solutions for material and about large cutting tables) I would have answered that I'd dream of a white box, sparsely furnished. A studio with nothing but a chair, pen and paper waiting for my thoughts. A room for creative solitude, for inspiration and productivity with as little distraction as possible, like a monastic cell with white-washed walls. A place where I could isolate myself from the rest of the world (even if 'rest of the world' only means the dirty dishes in our kitchen or the chicken coop that needs to be cleaned). But since I have begun with my #onebouquetperday project, spending time outside, picking flowers, the idea of the inside has slowly changed. I began to understand that the perfect workspace is not about that table and that chair and not about those blank pages that I would hunch over with a pen in my hand. All this is not what would turn a room into my creative space. What I need is an open door and large windows that would allow me to connect with the surroundings, let my eyes wander through the landscape, through different shades of greens, browns and blues, through the seasons. Challenging myself with the #onebouquetperday project, I've learned to maintain a healthier relationship with nature and what surrounds me. 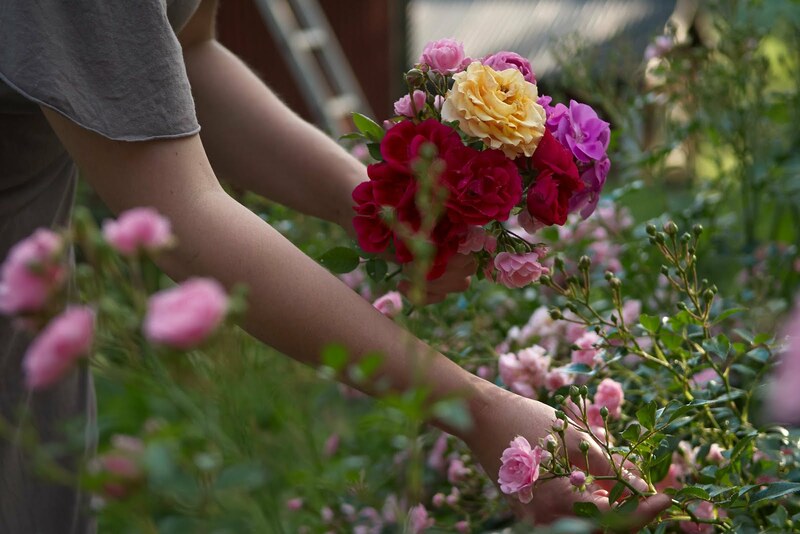 I have less time for rumination while picking flowers and can root myself in the landscape. I feel part of the creative flow that surrounds me. 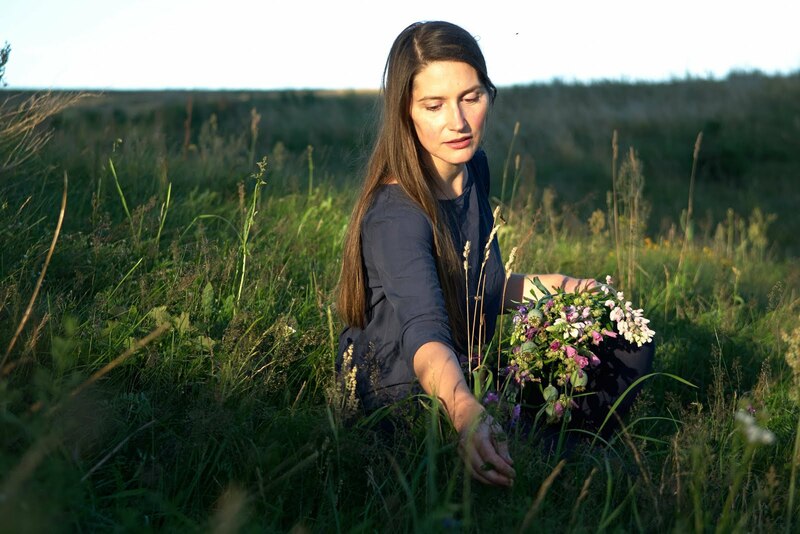 The meadows and fields around Björkåsa are like a large studio for me and I love the change of light and colour, of sounds and scents that allow me a more physical and visceral approach to my creativity. The lines between inner and outer space start to blur and I can be in the landscape and at the same time I can have the landscape within me. Through my #onebouquetperday series I have learned that all I need is to find a place where I can feel my imagination and memories don't get trapped between four walls, a floor and a ceiling. The view across the meadows, to the bog, to the ridge of hills and the extinct volcanoes on the horizon is what I have here at Björkåsa. I have no idea when we have turned the shed into a proper workspace (renovating Björkåsa will be a life-long project), but I have found my studio already; all I need is to put on my wellies and a warm cardigan and watch the cranes gather in the meadows. If you would like to see more of Juliane's posts, be sure to follow her blog. You will also find her on Instagram, Facebook and Pinterest and of course you can leave a comment here too, if you wish. There are a few more postcards to come before the end of the month, and you can catch up with all the others in this series here. If you'd like to share your images and the story of how your location influences your own crafting, please feel free to use the Instagram hashtag #makerspostcards and to tag @craftsformthecwtch so I will be sure to see the post.